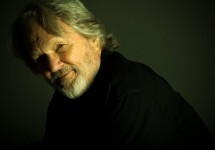 Country Music Hall of Fame member Kris Kristofferson will perform an intimate solo acoustic show at Nashville’s historic Ryman Auditorium on Saturday September 13, 2014 at 8:00pm as part of the “All for the Hall” concert series. Tickets will go on sale Friday August 15 at 10:00am. Ticket prices are $49.50 and $39.50 plus applicable service charges and will be available via ticketmaster.com, Ticketmaster outlets, Ryman box office, ryman.com or by calling 800-745-3000. All proceeds will go to the Country Music Hall of Fame and Museum. Funds raised through the All For the Hall concerts support the Country Music Hall of Fame and Museum’s preservation efforts, exhibitions and educational programs that teach audiences about the enduring beauty and cultural importance of country music. Find the most current Kris Kristofferson tour dates from our partners at Country Music On Tour, your trusted country concert ticket source! Country Music News Blog participates in advertising programs that help fund the operation of this site. For more information please visit our privacy statement. This entry was posted in Kris Kristofferson, News by Shauna "WhiskeyChick" Castorena. Bookmark the permalink.